The following unedited review was submitted by format, one of our regular contributors at HEXUS.gaming. The opinions expressed in this review are his own and not necessarily the views of the HEXUS.gaming team. Metro 2033 is a gripping action survival themed FPS game set in the grim post apocalyptic underground of Moscow. 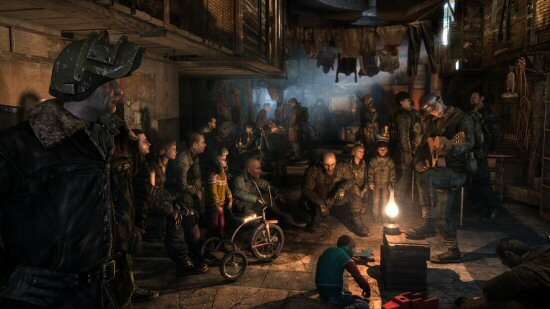 Throughout the game you play as Artyom, a young man raised in the tunnels. This underground world is populated by the survivors of a nuclear holocaust, as well a variety of mutated creatures and even paranormal forces. The plot centers around Artyom and his quest to find help for his home station 'Exhibition', which is under threat from the evil forces known as the 'Dark Ones'. You travel from station to station, seeking allies and fighting enemies. The tunnels are strewn with corpses of both, and you often run into survivors requiring help to defend themselves. Each station has a different feel to it - some are dominated by Nazis or Communists, others are small, democratic societies. There is a satisfying ambience to the environment - the denizens of the game often discuss pre-war society, or the latest news from the tunnels. It lends a real sense that Artyom is just one small man in a big, bad world, and depicts a history of conflict tinged with the regret of a society doomed to dwell underground forever. This bleak vision of the future is one of the most appealing parts of the game. 4A have invented a fascinating society in which there is evident scarcity of resources, and as a result, there is a real 'ad hoc' look to much of the game's dwellings and weapons. The bartering system is based on the trade of ammunition, which works as an extra incentive to both conserve ammunition and thoroughly search all areas of the game. At times in the game you are required to travel above ground. The ruins of Moscow are in the grips of a nuclear winter, and the decaying city is equally as treacherous as the dark abyss which lies below. The atmosphere is poisoned, meaning that Artyom must don a gas mask when above ground. The filters on the gas mask do not last long, and the visor is easily breakable, lending a real sense of urgency to your surface forays.